Elgin County, Ont. 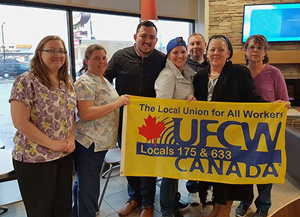 – April 13, 2018 – Personal support workers (PSWs) at the Victorian Order of Nurses for Canada are the newest members of UFCW Canada Local 175 after recently voting to join the union. The 38 full-time and 12 part-time employees provide community health and supportive housing services throughout Elgin County in Southwestern Ontario. The workers’ concerns included pension issues and job security. Other concerns centered around benefits, health and safety, and favouritism. In addition, a number of employees had previous experience working in a unionized environment, and were therefore aware of the benefits that a union can bring to a workplace. “It was a long journey, and the workers faced many challenges. It was especially difficult to identify all the employees since there is no centralized work location. But our main supporters did a great job. They showed that with enough determination, change is possible,” says UFCW Canada Local 175 Organizer Ricardo Bocanegra. The personal support workers join many other UFCW Canada Local 175 members who work as nurses, PSWs, and health care providers in the Health, Office, and Professional Employees (HOPE) sector. UFCW Canada Local 175 represents over 70,000 members across Ontario in almost every sector of the economy. To learn more about UFCW 175, visit their website.